You are currently browsing the tag archive for the ‘cranberry’ tag. Weekend Cooking is open to anyone who has some kind of food-related post to share: book (novel, nonfiction) reviews, cookbook reviews, movie reviews, recipes, random thoughts, gadgets, fabulous quotations, photographs. It is hosted by Beth Fish Reads. I’m writing this post in whisper-mode. That has nothing to do with Mr Gnoe sleeping late this Saturday morning. I’m just embarrassed to confess that with the dawn of February, I still had some ‘fresh’ cranberries left over from… Christmas. Oops! 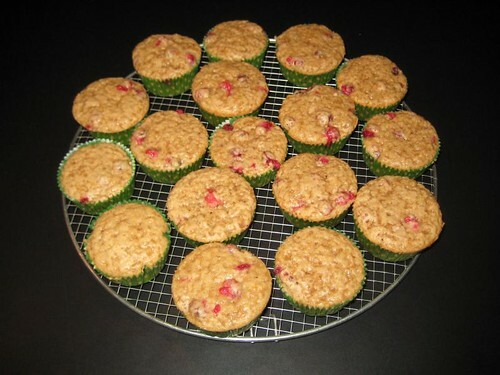 So I felt a jolt when I stumbled upon the cranberry muffins Uniflame had baked. Just perfect! Except.. they weren’t vegan. But now that I’ve been ExtraVeganza for more than a year, it’s about time I took on a challenging recipe to veganize. So I went back to the original Dutch recipe on Yummy in my Tummy and got to work. What do you know? I was done in a jiffy! :) [drumroll..] Here’s the result! Now I’m rather eager to share the recipe with you all! Preheat oven to 200 °C (). 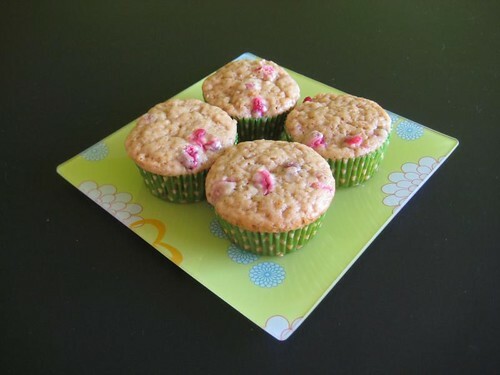 Grease a muffin tin or fill either silicon or disposable cupcake liners. In a large bowl combine flour, baking powder, sugar, salt and cinnamon. Whisk well. Combine the soy milk and yoghurt in another bowl or measuring cup, add the melted butter and stir well. Add the wet to the dry mixture and stir with a wooden spoon until batter is just mixed. Bake the muffins about 20 minutes in the oven; they should be golden and when you pierce them with a skewer it should come out dry. Mine took 23 minutes but it depends on your oven. Let the cakes cool down in the tin for 5 minutes, then take them out and let cool further on a rack. If you wish you can sprinkle the muffins with powdered sugar after they have cooled down completely. I didn’t find this necessary taste wise. Although these muffins are best eaten on the same or next day, they stay pretty good for a while longer. It’s just that the top gets a little sticky after two days, but you can hide fix this with a sprinkling of powdered sugar. * I’m not a shareholder of Provamel! ;) I’ve just had great experience with their products. You can use any plant-based butter but if it’s got vitamin D3 added (which it often does), it’s not vegan! 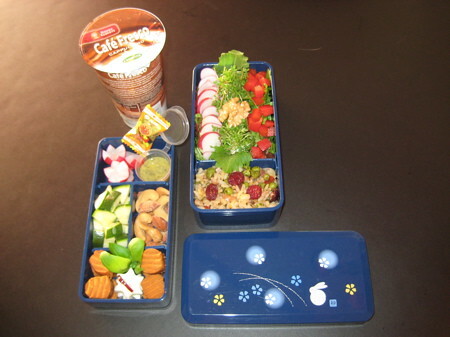 Friday 19th’s bento (#55) was another good one :) I used a lot from our weekly bag of veggies from De Aardvlo, organic vegetable gardens nearby! 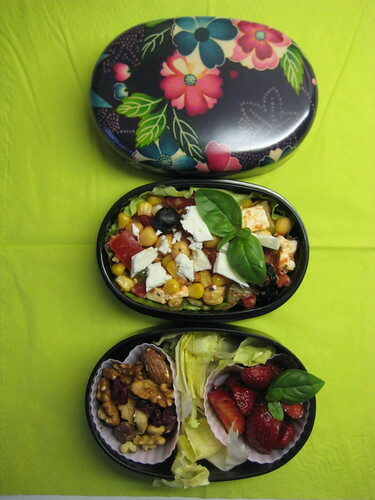 The upper tier contains a salad of corn kernels, tomato (*), red bell pepper (*), black olives, shallot, leek white (*), gherkin, lettuce (*), chickpea, basil (*), feta cheese and dressing from Oil & Vinegar fruschetta mix. 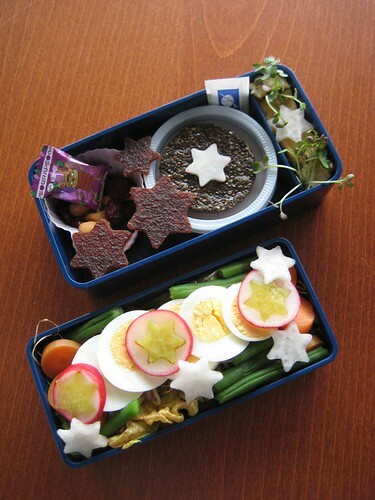 Oops, it took me a whole week to post about bento #52! 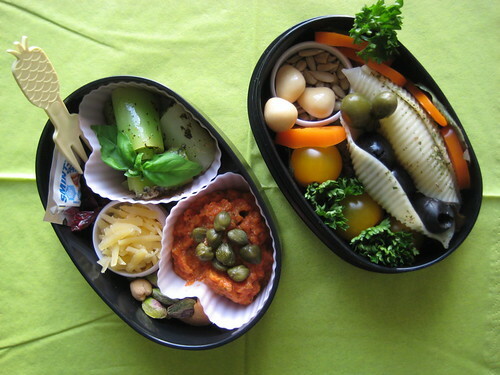 It came to work on Wednesday May 20th — and it’s been my last bento up until today. I was too busy! 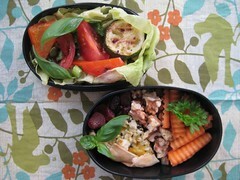 And I don’t have to go to the office for a while now, so bento’s will be sparse in the next few weeks. The red stuff you see in the left hand tier is Mediterranean bean paste, which erm.. had a bit too much garlic in it :-o I don’t like tasting garlic all day, so I came prepared. Here’s another one of Gnoe’s tips: natural & healthy remedies against garlic smell (and taste) are drinking milk, eating an apple and — last but certainly not least — chewing on a bunch of parsley. That’s after you’ve eaten garlic, not before ;) In my experience these solutions work best if you don’t apply them immediately, but after you’ve brushed your teeth without result. 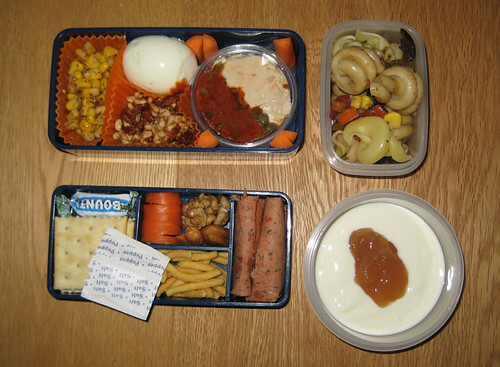 What else could be found in bento #52? Both the leek salad and the bean paste were easy to make. But… the bean spread was best on the day it was prepared. Next day it had gotten a bit ‘watery’ and needed the salty & sour addition of capers and olives. Thursday and Friday were moving days at the office. For me, Friday was the first day in the new building. 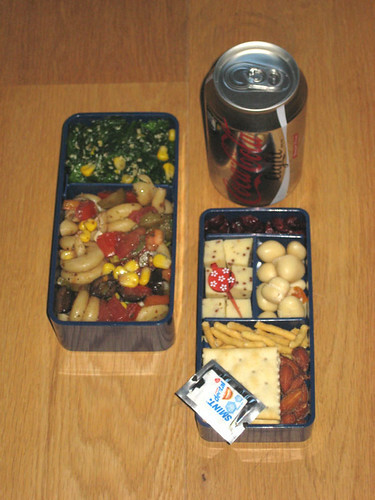 I brought a bento with side dishes since I didn’t know yet how hungry I would be from all the hard labour, nor if I would be able to buy any food in or near the office site (it’s not located near town anymore). But there seems to be a canteen that I can go check out next week. and two pickles rolled in fake meat slice. On the side some yogurt with prune jelly (homemade by my mother in law). and a smint for a fresh breath afterwards. Notice the nuts, fruits and seeds theme?